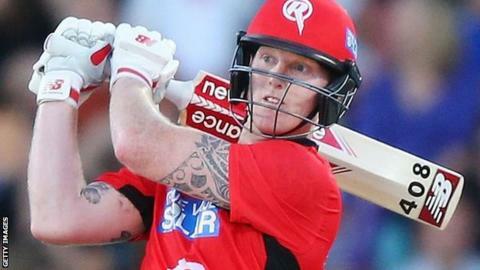 England all-rounder Ben Stokes scored 77 off just 37 balls on his Australia Big Bash debut for Melbourne Renegades. The 26-year-old Durham player - who was left out of England's World Cup squad - struck eight fours and five sixes in his innings against Hobart Hurricanes. "I backed myself with my skills and thankfully it came off. It's nice to be involved out here," Stokes said. The Renegades won by 37 runs against a Hurricanes side including England players Alex Hales and Tim Bresnan. Former England batsman Kevin Pietersen questioned why the England selectors left him out of the 15-man squad for the World Cup in Australia and New Zealand starting next month. He tweeted: "A star in the making. He's showing it this eve! Good on him! I cannot for the life of me believe he's not in World Cup." Stokes joined Renegades for the remainder of the Big Bash competition as a replacement for injured New Zealand all-rounder Jesse Ryder. He is one of 11 English players in the competition.